NETWORK UPDATE: SHARK TANK and the rerun of MASTERCHEF JR each gained 0.1 in final numbers. Discovery’s entire primetime line-up was thematically linked, and all of them landed in the night’s Top 4, with GOLD RUSH: THE DIRT kicking things off at 0.66, leading into the night’s #1 show, GOLD RUSH itself (up 0.22 to 1.49), followed by EDGE OF ALASKA (up 0.17 to 0.76). Their reign was interrupted only by Syfy’s WWE show, up 0.09 to 0.77, whose lead-out Z NATION was up 0.05 to 0.52, while lead-in HAVEN gained 0.02 to 0.22. ESPN’s NBA game was down 0.05 to 0.55, with COLLEGE BASKETBALL at 0.34. KENDRA ON TOP (We) gained 0.08/0.01 to 0.49/0.42. DEAL WITH IT (TBS) rose 0.04 to 0.44. 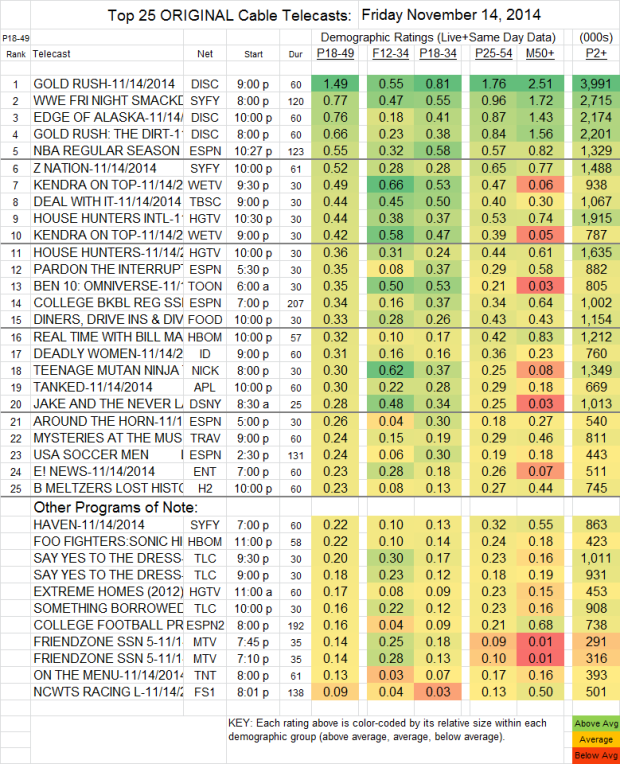 REAL TIME WITH BILL MAHER (HBO) lost 0.05 to 0.32, but FOO FIGHTERS: SONIC HIGHWAYS rose 0.05 to 0.22. ON THE MENU (TNT) lost a fair percentage of its rating, down 0.06 to 0.13. On IFC, COMEDY BANG BANG lost 0.02 to 0.01, with 40K total viewers, and BIRTHDAY BOYS remained at 0.01, but with 28K total viewers.